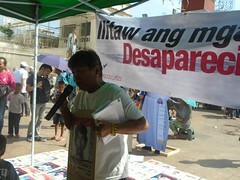 DESAPARECIDOS or Families of Desaparecidos for Justice is an association of the families and close friends of victims of enforced or involuntary disappearance. They came together in March 1995 to form their own organization. Together and drawing strength from one another, they search for their loved ones never giving up hope for justice. They campaign against abduction and enforced disappearance which they believe are being perpetrated in line with the government’s political suppression of its critics. 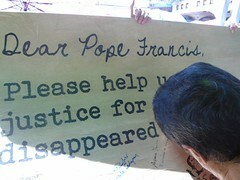 Through advancing human rights, Desaparecidos strives to effect positive changes in Philippines society. 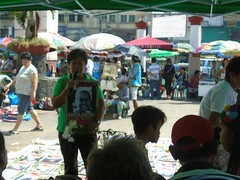 The families of victims of enforced disappearance are in a situation particular to them: “The family and friends of disappeared persons experience slow mental torture, not knowing whether the victim is still alive and, if so, where he or she is being held, under what conditions, and in what state of health. Aware, furthermore, that they too are threatened; that they may suffer the same fate themselves, and that to search for the truth may expose them to even greater danger. Recognizing their common situation, needs and goals, the families and friends of the disappeared in the Philippines got together and formed their own organization. It has affiliate organizations in Southern Tagalog, Central Luzon, Bulacan, Bicol, Iloilo- Panay, Negros, and Central Visayas.